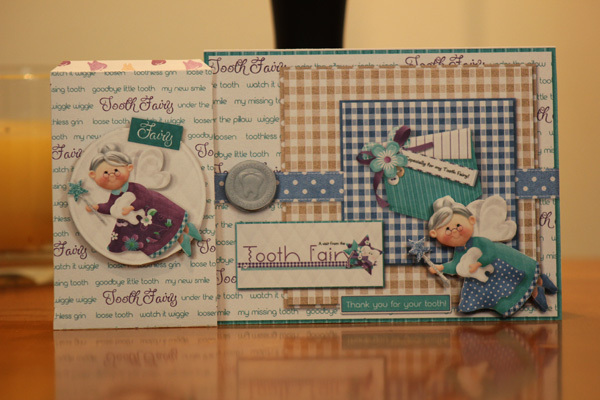 "Tooth Fairy Sachet & Card" Hybrid are great accompaniments to our NBK - Tooth Fairy Mini Kit. Not only is it a moment that you want to capture by creating a scrapbooking layout, but also be a part of! The sachet is the perfect little personalized pouch to place your "Tooth Fairy" money in when trading it for the tooth under your child's pillow. We have also included a card front for you to add along with the sachet, as it would be the perfect hybrid pair to send to your grandchild if you were not able to be there at the time of the "loss". Finished sachet is 2 1/2" x 4" or 6.75cm x 10cm and card front has decoupage elements included. 2 Template sheets (templates already have the pattern on them)with instructions for cutting and assembly of both the sachet and card front. Recommended paper weight for this project is 55-61 lb or 170-230GSM.